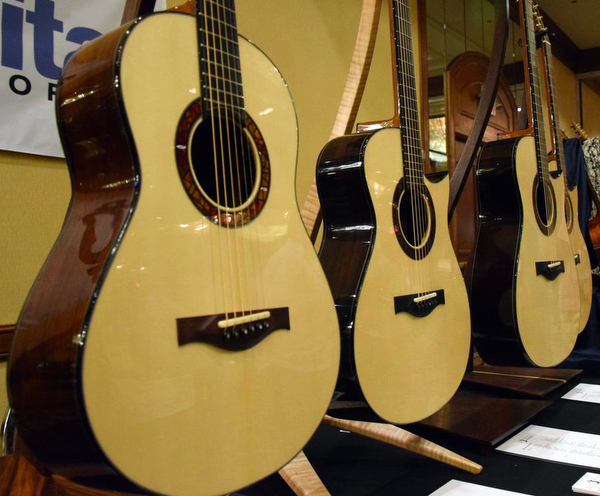 I’m at the first Memphis Acoustic Guitar Festival, wandering among the display tables of the eighty, or so, luthiers and eavesdropping on conversations between the guitar makers and potential buyers. 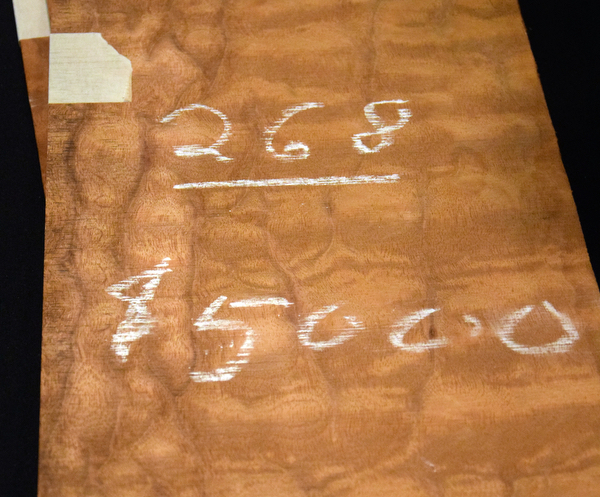 Conversation about the guitars’ components inevitably broaches the topic of “the tree,” “which tree,” “some tree,” (I spotted a back and sides set of “The Tree” mahogany with a sticker price of a mere $5,000) before moving on to elements of design, the luthier’s sonic goals, and the instrument’s suitability for flatpicking, fingerpicking, strumming, etc. 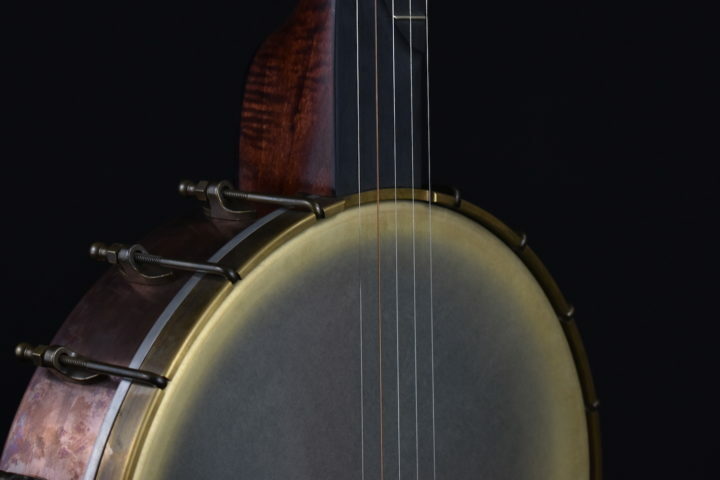 The setting provides an extraordinary opportunity for viewing and playing several hundred exquisitely crafted guitars, mandolins, and, even, banjos. 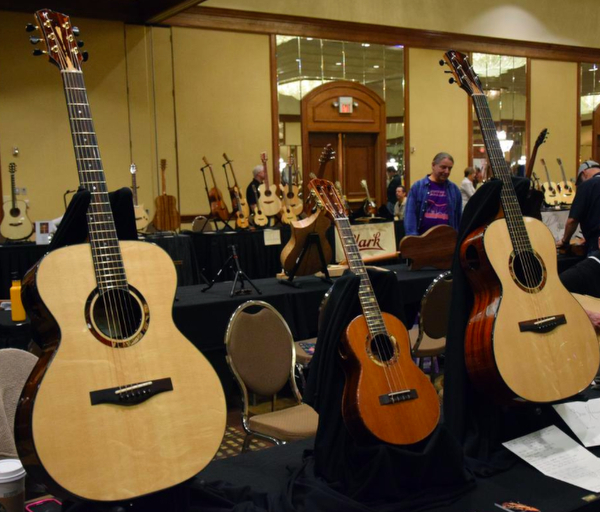 The luthier tables fit easily into the spacious ballroom; traffic is light – never more than about 100 tire kickers at any time, which allows for access to instruments and chairs. 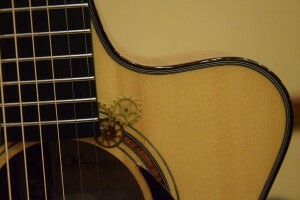 The volume from conversation and guitar picking is moderate, so players, if they lean closely to the instruments, can hear the tone of that the craft and components generate. In addition, better listening is available just outside the ballroom. Oh, and the temperature is a brisk 62 degrees Fahrenheit. We’re in Memphis and the air conditioning is apparently set to keep comfortable folks in business suits with their ties cinched up as tightly as possible. Pleas to raise the temperature bring staff with smiling faces who happily adjust the thermostat … to no apparent effect. So, guitar sellers and buyers alike are sporting sweatshirts and sweaters. Although the sonic eye candy is nearly impossible to resist, a bevy of workshops and concerts by the likes of Richard Smith, Michael Chapdelaine, Paul Asbell, and others beacon. So, like most here, I split my time between sampling the wares and enjoying guitar performances. My focus here, though, is on my time in the exhibit hall. I certainly wasn’t methodical in my methodology. I simply wandered the ballroom and stopped when fancy struck. 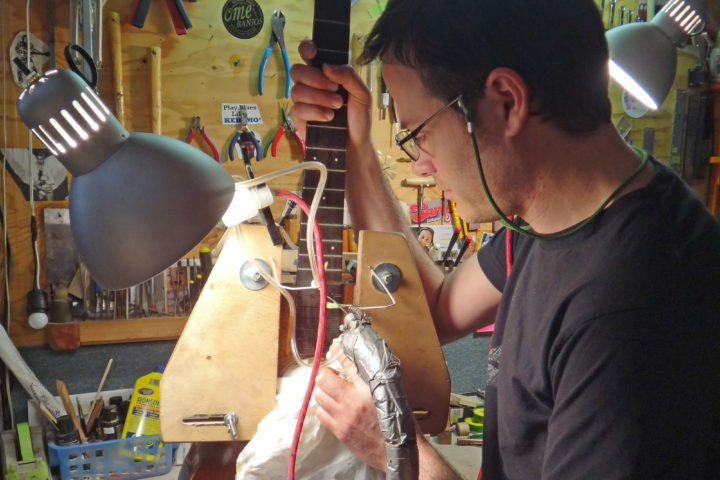 I didn’t play every instrument or even instruments built by every luthier present, though I did come close to the latter goal. The luthiers were delighted to have players stop to check their craft. All were obliging in pointing out the features of an instrument, and, thankfully, only a few were too willing, telling folks, “this one has huge voice,” “one of the best guitars I’ve ever made,” or, “this is one sweet box.” These were, on balance, a humble group of artisans. Most of these folks were more likely to praise the work of their colleagues than to tout their own. I didn’t meet a guitar that I didn’t like. What I offer here are a few of my favorites. I don’t claim that these are the best in show or, certainly, that I’m qualified to make such a list. These guitars struck my fancy. I’ve endeavored to select the plain and the fancy, the work of the well-known and the unknown, and the expected and surprising. 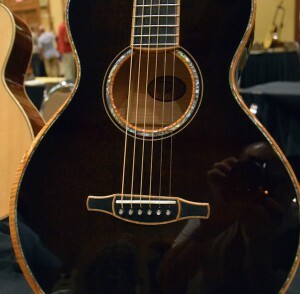 So, my inadequacies and biases disclosed, here, in no particular order, are a few of my favorite things from the Memphis Acoustic Guitar Festival. Tom Doerr’s mantra is “Detail that Endures.” His craft certainly exhibits gorgeous and gorgeously executed detail. And, the tone, playability, and beauty of his guitars have endured with me from the moment I played the first note on one of his creations. My favorite and perhaps favorite instrument at the Festival was his maple and Swiss spruce Legacy Select, a twelve fret, short scale, approximately 00-size guitar. 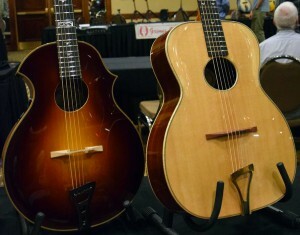 The body shape melds the Martin 00 with the rounded lower bout of, say, a Gibson L-1. To this pleasing shape, Tom added a translucent black stain, with natural maple and abalone highlights. The tone was crisp, yet warm. The perfect maple 12-fret flattop guitar. In a word, “sublime.” Every aspect of a Joel Michaud guitar – every sculpted surface, every mitered joint, every liquid note – is sublime. 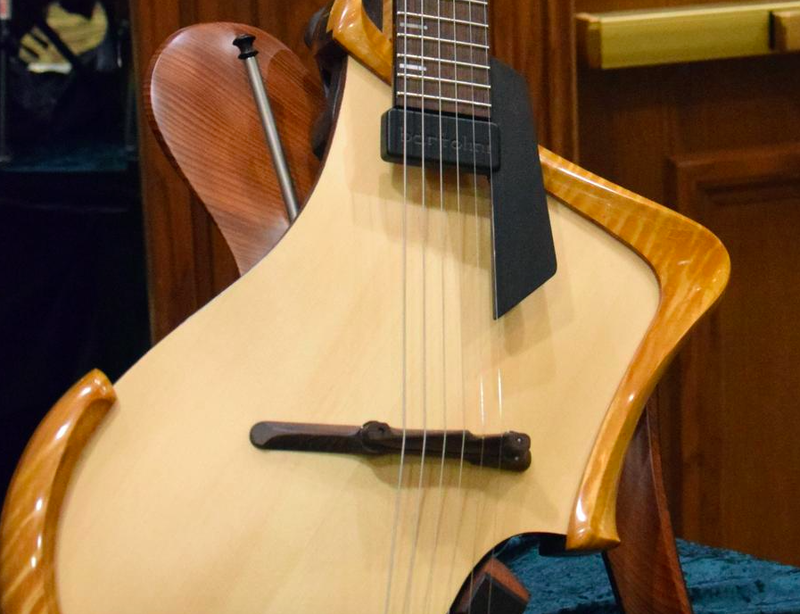 For my ears, eyes, and style of play, my favorite Michaud at the Festival was his 00-R with “scoop cutaway, a bit of sculpture that provides access to higher frets and makes a guitar look, well, more sublime. Michaud used “The Tree” mahogany for the back and sides. For the uninitiated, the tree hails from the Chiquibul Forrest of Belize, where it was felled in 1965. The wood has become exceptionally scarce. A comparison with the rarest of rare vintage guitars may prove helpful. Of the original 91 prewar Martin D-45 guitars built, only 157 exist today. Similarly, of the original 11,000 board feet harvested from The Tree, only 17,000 board feet remain. (OK, not really. Less than 1% of those original 11,000 board feet remain available. No comment about how many original D-45s exist.) 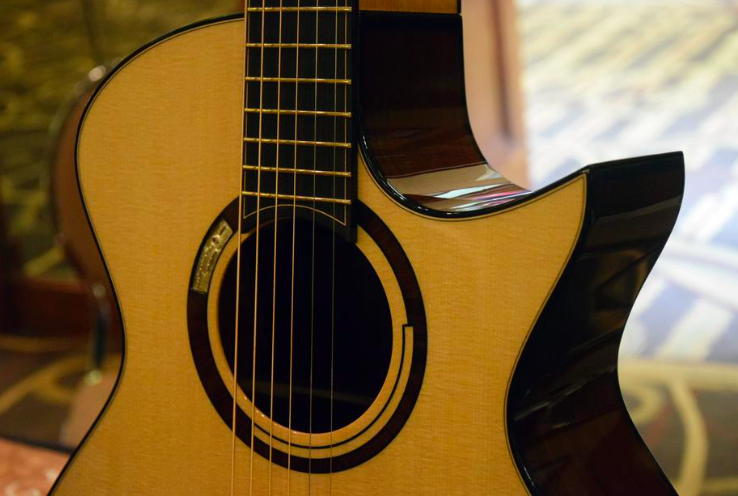 The guitar is everything that a perfect mahogany 00 ought to be … and more. Warm, clear, and rich. All of Michaud’s offerings tickled my eyes, ears, and fingers. But, from the perspective of visual aesthetics, his German spruce/Madagascar rosewood, cutaway OM-R stood out, even among a table full of standouts. Michaud teamed with jeweler Frances “Franny E” Strathern to create a unique work of art. 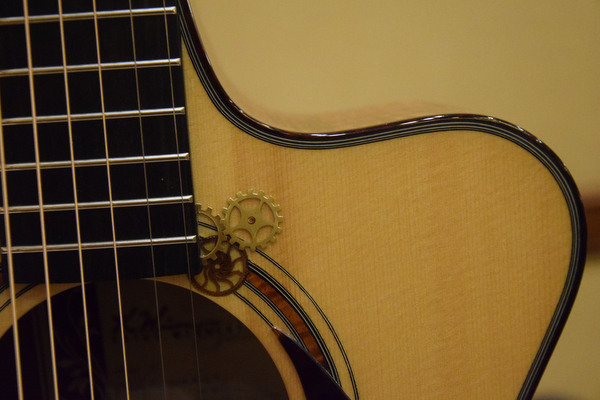 Strathern sculpted bejeweled pieces of metal jewelry that Michaud inlay into the rosette, back strip, and headstock of the guitar. 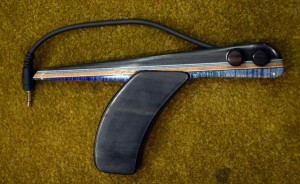 The resulting “Wood meets Metal” is a wonderful musical instrument and an example of functional sculpture. From every perspective – visual, aural, tactile – Matusda’s creations always challenge, please, and astonish. With his “headless archtop,” in a stunningly beautiful manner, he deconstructed the jazz to guitar to its essentials. As with all of Matsuda’s creations, I was torn between playing the instrument or grabbing it and running straight to New York City to place it in its rightful spot at the Museum of Modern Art. 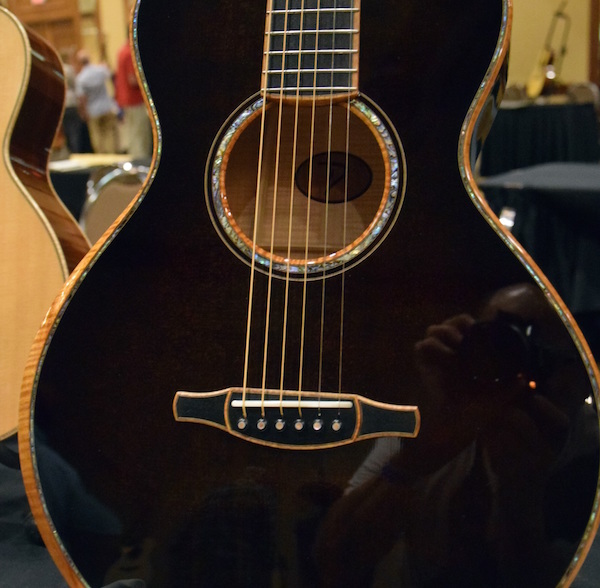 Seeing no amplifier and noting the Festival security, I turned my attention to Matsuda’s other offering, a gorgeous wenge and European spruce, cutaway OM-size guitar. The guitar, warm and crystalline clear, tempted me to try my luck with those security guards in an attempt to closet it away in my hotel room. A wonderful instrument. 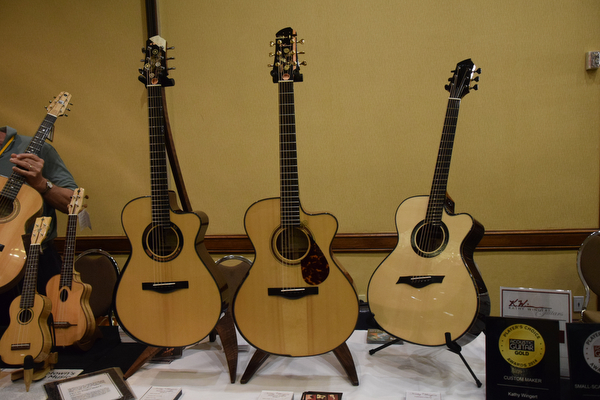 Baranik presented three excellent offerings: a Retreux parlour in Palo Escrito and Blue spruce, a 00 in figured mahogany and red spruce, and a fan fret Meridian (small jumbo) in Cocobolo and Blue Spruce. While all were lovely, the third captured most of my attention. It featured an Art Deco visual aesthetic, including square fretboard inlays, intricate angular purflings and inlays, and an elliptical rosette inspired by the Atlas statue that stands in front of New York City’s Rockefeller Center. Gorgeous work and a stunning sounding and playing instrument. Beau Hannam brought an update to one of my all-time favorite guitar models, the Gibson L-00. Built of Sitka spruce and cocobolo, the guitar featured Hannam’s understated, elegant visual aesthetic, including a gorgeously executed rosette. Sonically, Hannam managed to retain that Gibson bark while adding gorgeous sustain and warmth. 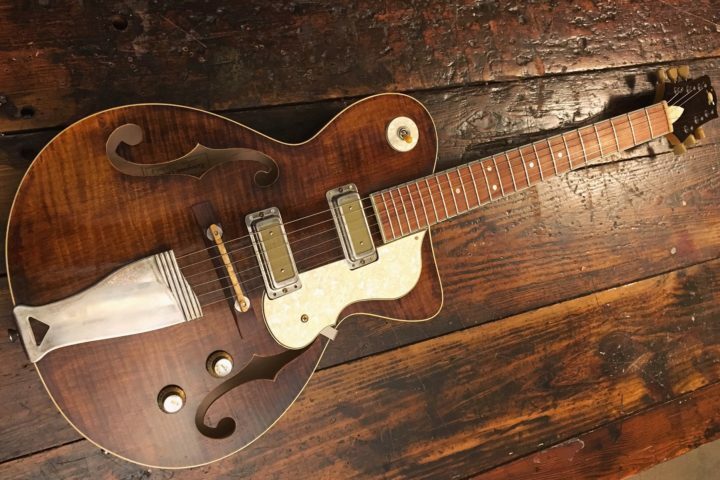 Aaron Andrews presented two of the coolest guitars I’ve encountered, with both inspired by inexpensive, catalog guitars of the 1920s and 1930s. Andrews’s Eclipse Style A is a Sitka spruce and cocobolo arched top, flat back, oval sound hole ode to the 1920s May Bell/Slingerland Style 74. Bark, bite, and retro coolness. What more could you want? “A modern, beautifully crafted replica of the Kay Kraft Recording King,” you say? Coming right up! 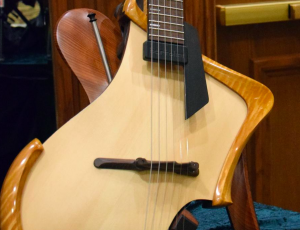 Hands down hippest instrument at the Festival, Andrews’s “Zorzi” is an Engelmann spruce and myrtle carved top homage to Italian-immigrant Joseph Zorzi, who designed the original in the late 1920s for the Kay Company. A great sounding, playing, and looking guitar. Into that 1920s and 1930s vibe, but more a fan of the exquisite work of Martin than the affordable catalog guitars? Julius Borges is your luthier. Borges presented two delightful replicas of Martin’s finest work: an OM-45 and an OM-18. Both played and sounded magnificent. However, being a mahogany lover, I spent most of my time with the OM-18. Built from sinker mahogany and red spruce, it is the perfect 1930s OM-18. Crystal clear and powerful. Jason Kostal brought his full lineup to the Festival: Jumbo (German spruce/Cocobolo, with Manzer wedge), Modified Dreadnought (German spruce/Brazilian rosewood, with Manzer wedge), Orchestra Model (German spruce/Celebes ebony), and 00 (German spruce/ Madagascar rosewood). Each featured Kostal’s staggering attention to detail and glorious, liquid tone. However, I’m a small guitar fan, and that 00 stole my heart. 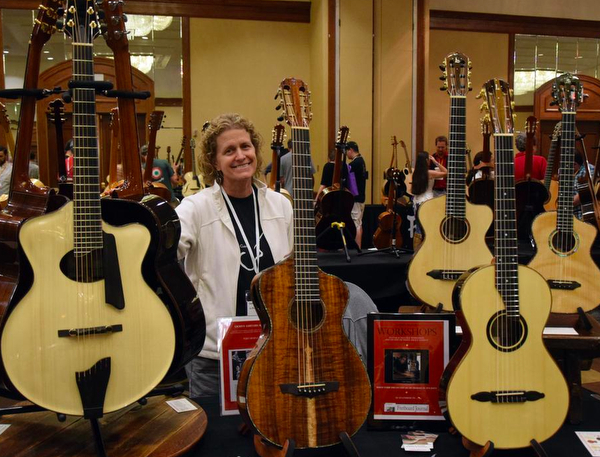 OK, disclosure time: My own guitar, which I built in a one-on-one workshop with Jay, was sitting on the Lichty table (pictured above in the middle). So, I won’t feign objectivity here: I like Jay and his instruments. This said, two of Jay’s guitars caught my attention: a spruce and maple carved archtop with round sound hole and flat back and Sitka spruce and Madagascar rosewood small jumbo. The archtop combined the bite of an archtop with some of the warmth of a flattop. The small jumbo simple offered the biggest, warmest tone I’ve encountered in a guitar. Oh, and my guitar was pretty good, too. 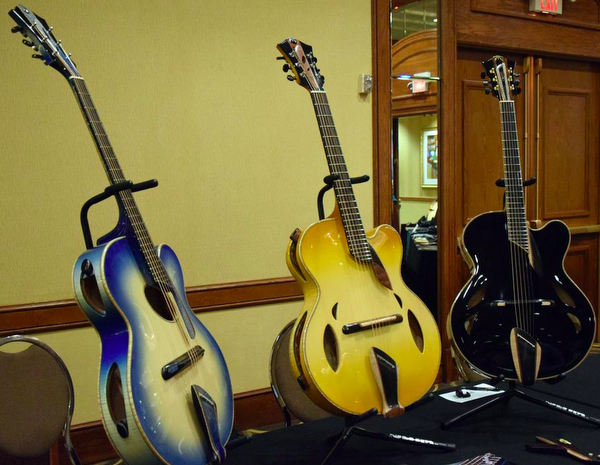 Cristian Mirabella brought three gorgeous archtops in hues of blue, yellow, and black. His instruments betray the influences of D’Aquisto and, especially, Monteleone, but Mirabella adds his own visual and tonal twists to archtopia. These were all wonderful instruments and I especially enjoyed experimenting with the sliding doors to the sound ports. Coolest, though, was Mirabella’s easily removable, beautifully sculpted wooden pickguards containing custom, hand-wound pickups and tone and volume controls. Now, where is that amplifier? Kathy Wingert showcased two of her creations that exhibit attributes of the “Steampunk” aesthetic, that whimsical visual movement that mates Jules Verne with the Victorian Era and all things mechanical. In Kathy’s clever hands, this takes shape through inlays of tiny cogs, wheels, and wires. The result is bold, beautiful, and amusing. Jules Verne would have loved these guitars. Of course, proof is in the sound, and those Steampunked guitars were, well, steamy and spunky. Great stuff.